Note from shop owner Hi, thanks for stopping by! I am currently working on two new collections, due to which I am temporarily taking a holiday from Etsy. Curious? Follow progress on my website: www.hannie.se or @hannieshantverk on Instagram and Facebook. You are always welcome to get in touch via email on hantverk [!at] hannie.se, whether it's regarding a custom project, product care or anything else. Hannie is outstanding! Hannie, thank you for making it sure that we receive the beardy boys on time. You are an amazing person! And it shows in your handwork! So in love with my tomte! I will purchase for more tomte next time! With Love from Sydney, Australia! 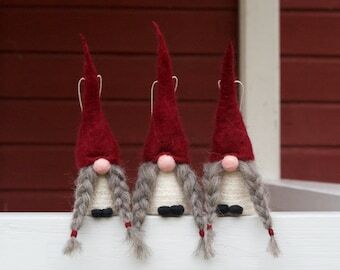 Love these gnomes! Giving them to all my family members! These ladies are waiting patiently in line to have their hair braided. They are on their way to Canada tomorrow and very excited about it! Weighing the wool for the next rug with coloured soumak detail. Don't forget; 10% off in my shop until March 12th with coupon code YAY17! These boys and girls left for Germany today; they love to travel! Most things you find in my shop start as a basket of fibre. Spinning by hand means I can make exactly the yarn I have in mind for my design. 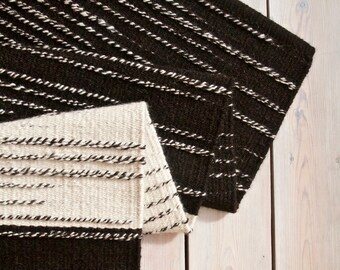 Work in progress on one of my woollen rugs. I learned to knit when I was 3 and have been doing so to greater or lesser extent ever since. Over the years I have added spinning and weaving to my bag of tricks and simply can't imagine life without yarn. Almost everything you find in the shop starts out as a basket full of fibre; mostly wool, but flax, silk and mohair (amongst others) occasionally also find their way to my spinning wheel. There is a little bit of magic in transforming that fibre into a finished piece that has a practical use, like a bag or a scarf. Everything happens right here in my little red wooden house in the Swedish countryside: spinning, dyeing, weaving and knitting. I love the natural whites and greys of wool and often use those as the background colours for my designs. My style is uncomplicated with a splash of colour and often a textural element as well. I like the idea that you can feel the colours on a cushion or a rug. I love using natural and re-used materials to make beautiful things that bring a smile to your face every time you use them. I treat you private information the same way I would like to see my own information treated. I will not share your information unless legally required to do so (in case of a tax audit for example) or if it is necessary in order to complete your order (I have to share your address with the postal service in order to be able to ship your package). I don't send out newsletters or spam.